Win 40 bred heifers or $70,000 cash - Buy your raffle tickets now! Join the sponsorship excitement in one of the fastest growing and most traditional Stampedes in North America. I have been going since I was a kid, now I get to share the Ponoka Stampede with my children. I have really enjoyed every year and look forward to many many more!! Rain or shine, it's one heck of a great time!!! My wife and I were first-timers to the Ponoka Stampede, and I must say... it certainly did NOT disappoint! Great value, intense action & excitement, and the most friendly and hospitable community we have had the pleasure of visiting; coming all the way from Thunder Bay, Ontario to experience it. Kudos to rodeo organizers here, for putting on a class act! It is one of the best Rodeos in the world. Top notch stock & cowboys. The volunteer work force behind this production deserves a gold medal, they seem to go above & beyond to make sure you enjoy your stay in Ponoka. Thank you Ponoka, and can't wait for next year. Two thumbs up. Great price! Great show! Great people! Definitely making it an annual thing!!!! So glad I went. Been coming since we were little, it gets better every year!! Good job!! 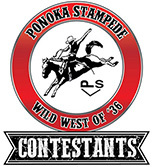 Are you entered in the Ponoka Stampede?